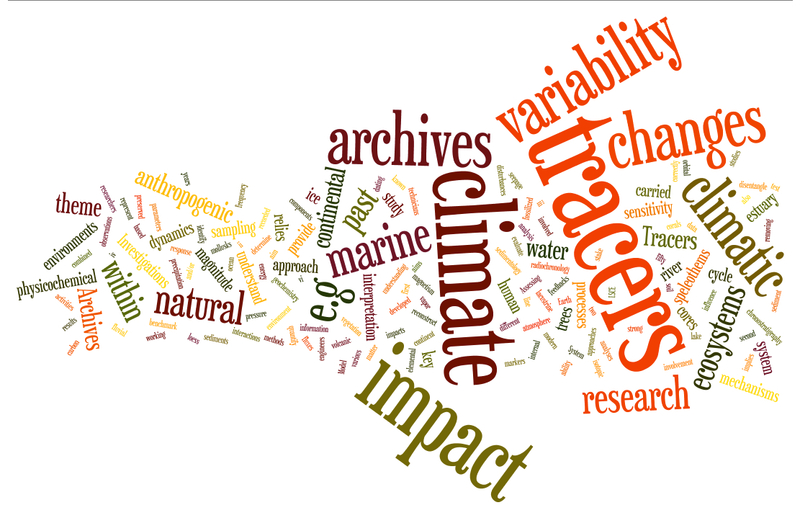 The aim of work carried out by the "Archives & Tracers" group is to understand the dynamics and the natural variability of climate and to evaluate the sensitivity of marine and continental environments to climatic and anthropogenic changes. To understand the natural variability of climate, knowing the magnitude and frequency of past changes is a key step. To look back at the past makes it possible to get away from human disturbance. In these conditions, reconstruct past changes helps us to understand the functioning of the complex climate system and to identify and quantify interactions and fluxes between the different climatic system components: atmosphere, ocean, ice and continent. Study of past climate changes and of their impact on ecosystems tells us how the climate system responds to known perturbations (orbital and volcanic). For fifty years, LSCE has developped methods for reconstructing climatic parameters from the analysis of physico-chemical markers in natural archives (ice-core, marine and lake sediments, loess, speleothem, tree, coral, mollusc …). Such data provides a benchmark to test the ability of Earth System Model to correctly represent these mechanisms, the magnitude and dynamics of past changes. The evaluation of the sensitivity of marine and continental ecosystems to climatic and anthropogenic changes relies on two approaches. The first, in line with previous approach is based on the study of natural climate archives that informs of past impacts of climate change on various ecosystems. The second is based on the study of present ecosystems under the combined climate and human pressures (river, soil, marine environment, water cycle, …). This research is based on the investment of all group members from the sampling to results interpretation: i- sampling (ice-core, marine, lacustrine and fluvial sediment cores, …), ii- physico-chemical analyses including isotope geochemistry, magnetism, micropaleontology, sedimentology, …, iii- dating through both chronostratigraphy and radiochronology, iv- tracer meaning (climate and/or anthropogenic signal record, signal preservation and fossilization). The group includes five complementary research teams and group located either in the CNRS site in Gif-sur-Yvette or CEA site in Saclay: CLIMAG (Climate, Paleomagnetism), GEOTRAC (GEOchronology, TRacers and ArCheometry), GLACCIOS (Ice and Continent, climate and stable isotopes), PALEOCEAN (Paleoceanography), LANDER.